Menu planning makes my week run so much smoother! Here’s the method that works for me. We’ve had a busy week this week! David (our older son) is in a theatre performance this weekend and I’m helping as stage manager. We’ve had rehearsals every night this week. It’s weeks like this when it’s important for me to take 10-15 minutes to decide on the menu plan for the week. It eliminates decision fatigue from having to decide right before dinner time! My method is pretty simple. I have a dry erase board up in my kitchen. On Sundays I fill in the activities for the week and the menu plan. I keep our favorite recipes in a spiral-bound cookbook I actually created as a wedding gift for my sister. (They printed it backwards so I got a free copy!) I keep newer recipes on a Pinterest board (The Pioneer Woman and The Schell Cafe are my favorite recipe sites!). Menu planning saves money because I know ahead of time what all I need to buy. One whole chicken can be cooked and picked for chicken pot pie for dinner one night and then added to stir-fry for lunch another day. We also don’t default to “What do you want for dinner?” at 4:45 and then decide it’s too late and just pick up fast food. Since I menu plan right next to our schedule for the week, I know if Lee has an evening meeting or if he’ll be home for lunch and can plan accordingly. 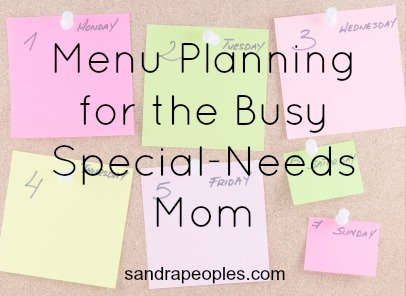 Menu planning is a huge help to our family!